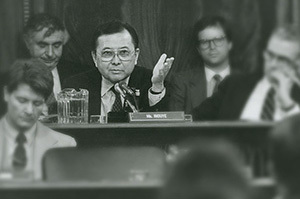 Senator Daniel K. Inouye was the second longest serving member of the U.S. Senate prior to his death, with a distinguished tenure of more than 49 years. 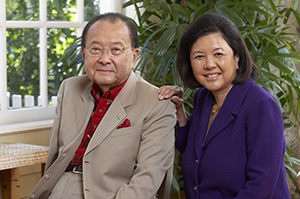 As president pro tempore from 2010-2012—third in line of presidential succession—Dan Inouye was the highest-ranking public official of Asian descent in United States history. For his heroic actions as a member of the famed 442nd Regimental Combat Team—resulting in the loss of his right arm—the World War II veteran ultimately earned the nation’s highest award for military valor, the Medal of Honor. 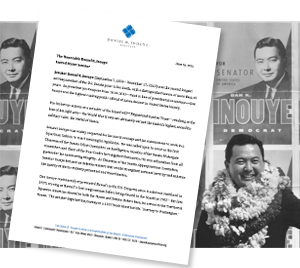 Senator Inouye was widely respected for his moral courage and his commitment to work in a bipartisan fashion to enact meaningful legislation. He was called upon to serve as the first Chairman of the Senate Select Committee on Intelligence, member of the Senate Watergate committee, and Chair of the Iran-Contra Investigative Committee. He won admiration from all parties for his unwavering integrity. As Chairman of the Senate Appropriations Committee, Senator Inouye focused on defense matters that would strengthen national security and enhance the quality of life for military personnel and their families. Throughout his career, Dan Inouye championed the interests of Hawaii’s people and left a lasting imprint through his efforts to strengthen Hawaii’s infrastructure, diversify its economy, and protect its natural resources. 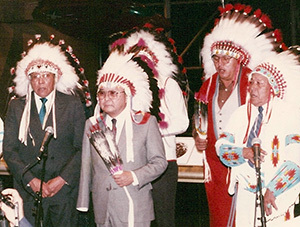 He advocated for the rights of Native Hawaiians, Native Americans, Alaska Natives, and sought equal justice for Japanese Americans and Filipino World War II veterans. He worked tirelessly for peace and stability in the Asia Pacific region and promoted efforts to build strong U.S. – Japan relations. 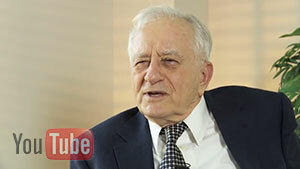 The senator was a stalwart supporter of Israel, knowing it was in America’s best interest. Most important, he inspired confidence in those whom he touched, inspiring them to pursue their dreams with both determination and a healthy dose of optimism for the future. Dan Inouye is survived by his wife Irene Hirano Inouye, son Kenny Inouye and his wife Jessica, granddaughter Maggie, and step-daughter Jennifer Hirano. Senator Inouye’s friends and colleagues share stories about his life. 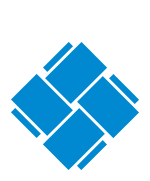 The Institute’s logo is based on Senator Inouye’s interpretation of his Japanese family crest, or mon.